Click Alpha's picture to visit his website. Hear some Music Clips of Alpha YaYa Diallo, one of the world's more appealing African artists. Guinean-born guitarist and singer Alpha Yaya Diallo, whom critics describe as "one of the most inspired and inspirational artists on the World Beat circuit today," has been based in Vancouver, since his arrival in Canada in 1991. During that time, he has toured extensively in Canada and the United States, winning critical acclaim both for the excellence of his musicianship and the excitement of his performances, both solo and as part of an Afro funk group called Bafung. Diallo came to North America as a member of the Dutch-based West African group, Fatala. Since then, he has recorded three albums featuring his own compositions. In 1999, he won Canada's most prestigious prize for music when his CD, The Message, won the Juno for Best Global Music recording. An earlier album, Futur (also nominated for a Juno award) won the Music Africa Award for National Recording of the Year and the Pacific Music Industry Award for Best World Music Album. His latest recording is The Journey won the Best Global Music Award at the 2002 Juno Awards. 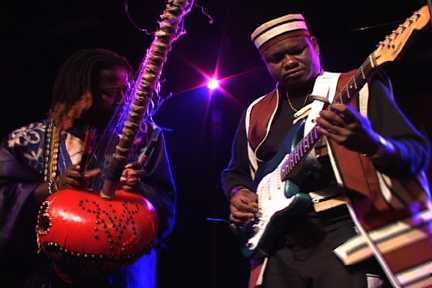 An expert player of the guitar, both acoustic and electric, Diallo produces music that combines Guinean instruments (a traditional drum called the djembe, for example, a wooden xylophone called the balafon and the kora, a kind of large harp-lute) with the Western guitar, bass and drum set. His fascination with the music of George Benson and James Brown can be heard in the exciting "World Beat Music" of Alpha YaYa Diallo. Alpha Yaya Diallo, from Guinea in West Africa, is one of the hottest acts on the current world music scene. Diallo is a uniquely multi-talented artist. His dexterous acoustic and electric guitar-playing, with its fluid melodic lines and compelling grooves, places him in the front ranks of African axemen. In addition he is a skilled and experienced performer on a variety of percussion instruments, and on the balafon (a wooden xylophone). Diallo writes his own songs, and his voice has a beautifully modulated edge. A self-taught musician, Diallo possesses a fine ear and quickly learned how to transpose for guitar the melodic and rhythmic patterns he heard played on indigenous Guinean instruments. Eventually Diallo found the opportunity to move to Europe, and became a member of Fatala - a group of West African musicians recording for Peter Gabriel's Real World label. Since settling in Canada, Alpha has released four highly-acclaimed albums of his own compositions. The Journey is undoubtedly Diallo's strongest album to date - powerful, beautiful, and sophisticated. He never strays far from his roots, while at the same time ensuring that his performances and his albums make use of the very latest advances in music technology. Simply put, Alpha Yaya Diallo is one of the most inspired and inspirational artists on the World Beat circuit today — playing music guaranteed to delight your ears, your heart, and above all your feet. Come out to Folklore Festival on Sunday at 1pm and experience Alpha YaYa Diallo's flavour of "World Beat Music". Remember how great the Sattalites were in 2002! See "ALPHA YAYA DIALLO" on stage May 2nd at 1pm!